The lovely Kate from Katey-Adventures tagged me in this post! 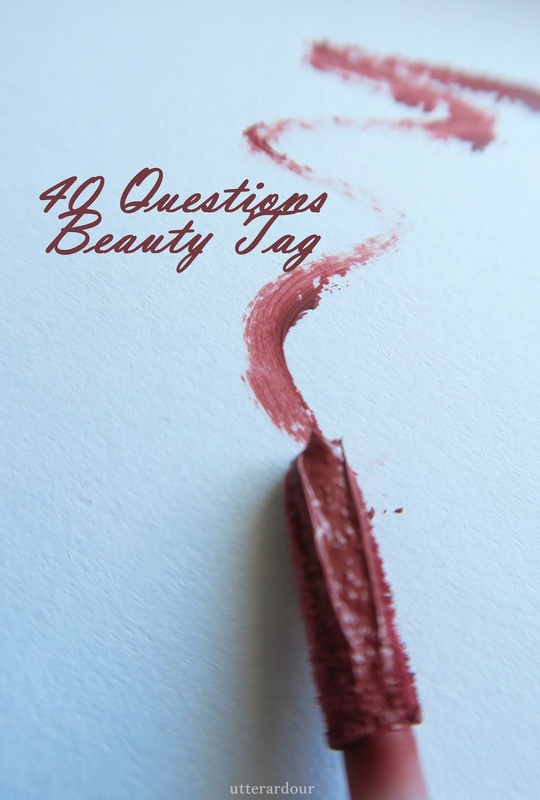 The 40 questions beauty tag! A great little tag to get to know my skincare/makeup go to items and for me to rave on about my favourite products! You can check out Kate’s own answers HERE, you have also recently seen her over on my travel collaboration! I was my face twice a day, morning and night. I am mainly combination but more on the dry side. Yes I do! I use a gentle one on my face every 3-4 days and I try to exfoliate my body once a week. Which reminds me I need to buy a new body scrub. 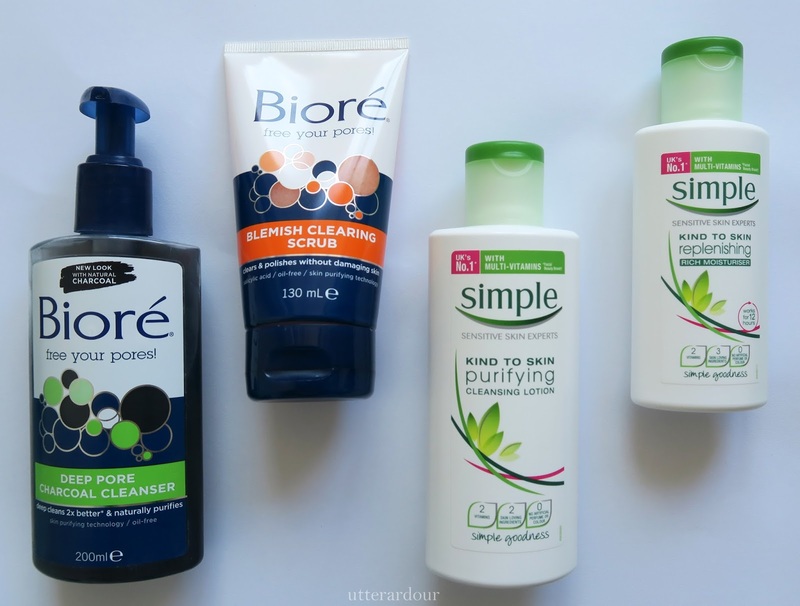 For my face I use Biore Blemish Clearing Scrub and for my body Soap and Glory. Yes, I used to have a lot more. I was covered but the majority of them have faded away. I wish they hadn’t I miss them! Nope, seen a lot of people use them though I should look into it. Did you ever use proactive? I did once. My least favourite Christmas present from parents. That’s right, my parents bought me acne fighting face wash as a bloody present. I’m still bitter haha plus it didn’t help at all just dried me out. At the moment my go to is the Rimmel Wake Me Up Foundation in ivory. To match my foundation I use Rimmel Wake Me Up Concealer. They look great on others but no way am I putting glue anywhere near my eyes. It would end in disaster, plus I like how long my eyelashes are already, so a coat of mascara is all I need. Like most makeup I don’t like keeping it for long. So yes I try to make it last as long as possible but if it does get to that point I will chuck it out. 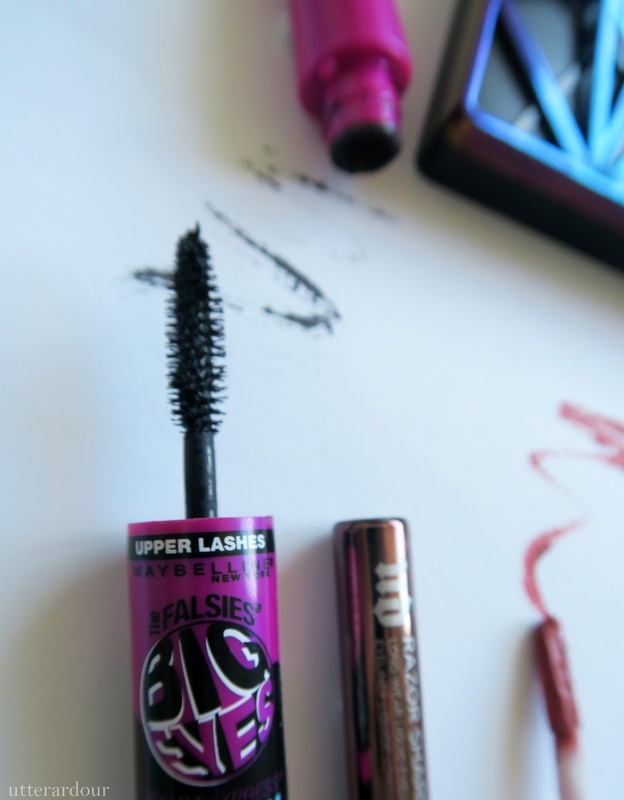 Maybelline The Falsies Big Eyes. I love how it doesn’t clump on the eyelashes like most and it comes with a wand for the upper and lower lashes. I would say neither but Sephora has a face mask I really want to try. I wouldn’t get MAC because not only is it expensive plus if I’m going to pay that much I’d rather a brand that doesn’t test on animals. I use my real techniques blending sponge and a few of their brushes. I have one Urban Decay eye shadow brush and the quality is so good I’d like to try their face brushes. Do you use a makeup base/primer for the eyes? I use Urban Decay’s Primer Potion for my main primer but for days I’m going more natural or wearing to work I just use my Australis eye primer. I use Australis Blemish Buster Primer. For around my nose I use Australis Cya Later Pores primer or my Smashbox Goodbye Pores primer. Every shade in the Vice Urban Decay palette, I can’t choose! I mainly use liquid even though I find using pencil a lot easier. I’m loving the Urban Decay Razor sharp eyeliners. Not often, I want to get into it more I’m just very bad at applying eyeliner. When I do though I luckily don’t poke my eyes out. I’m very in love with my NYX matte lipstick in Ruffle Trim, I wear it constantly. I really don’t like lip gloss, the texture is a no go for me! I only have two blushes and they are both cream, I really want to try powder blushes (so any recommendations are welcome) my favourite is the Maybelline Master Glaze in Just Pinched Pink. No, I haven’t bought of eBay for anything to be honest. I don’t think I would trust it with makeup. Yes, it is where I get the majority of my makeup! I would die without Priceline. Do you go to CCO’s (cosmetic company outlets)? Nope. I don’t even know if we have any here? I think it would be very interesting to take a SFX makeup course, but I don’t think I ever would. Are you clumsy with putting on makeup? Only the mess I leave around on the counter, its a battlefield once I’m done. People hating on makeup haha. 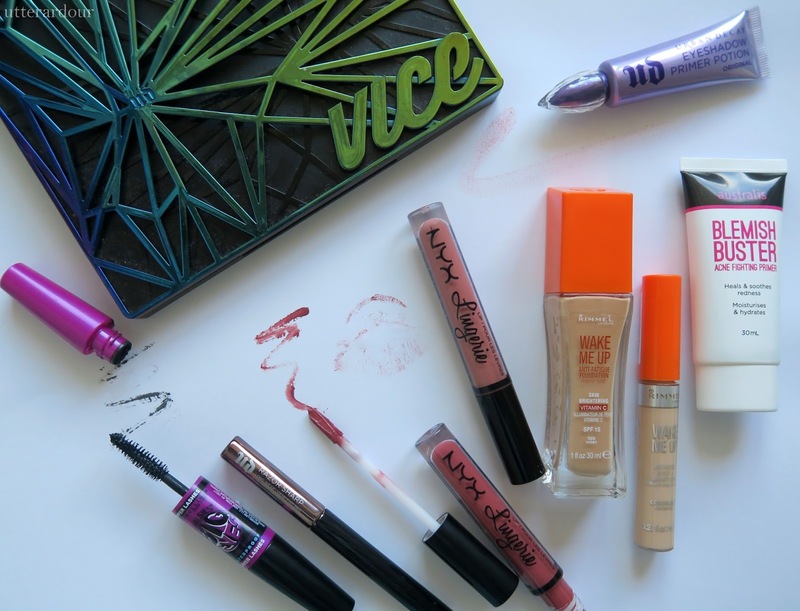 Do you like colourful shades of makeup or neutral ones? Depends on my mood, one day I will be all neutral another it’ll be bright pinks, purple or blue. It all depends, I love them all. I love Shay Mitchell’s makeup, her team are ace at it. I also am in love with anything Lucy Hale does. (There is a PLL theme here). Foundation, cause then I will still look natural but get to cover the redness and spots. I suppose so, I haven’t for ages and I do now feel naked without it. When I’m heading to the beach, which will be often when summer hits I won’t have makeup on. Do you think you look good without any makeup on? Once I get past the fact that people don’t care about my spots as much as I do then yes. A face is a face, there are more important things. Drugstore I love NYX and Australis, High End Urban Decay. I love it, a great art form and great way to get ready for the day. I like making it an event and experimenting. You get to express yourself differently every day its amazing! BAM, done! I’m going to tag anyone who wants to do this tag. Let me know if you do it!